Preheat the oven to 180°C/350°F; line a 20cm (8in) square baking pan with foil, leaving an overhang in two opposite sides. Butter the foil. Melt the butter and chocolate in a heatproof bowl placed over a pan of simmering water. Stir, then leave to cool slightly. Using an electric mixer fitted with the whisk attachment, beat the eggs and sugar together until the mixture is pale and thick enough to hold a trail when the beaters are lifted. Beat in the vanilla. Carefully fold the chocolate mixture. Sift the flour, baking powder, salt and cocoa powder together over the mixture and gently fold these in too. Finally, fold in the dried cranberries. Pour the mixture into the prepared baking pan and bake for 25-30 minutes, or until nicely crusted but still soft in the middle. Cool completely in the pan over a wire rack. Cut into squares. 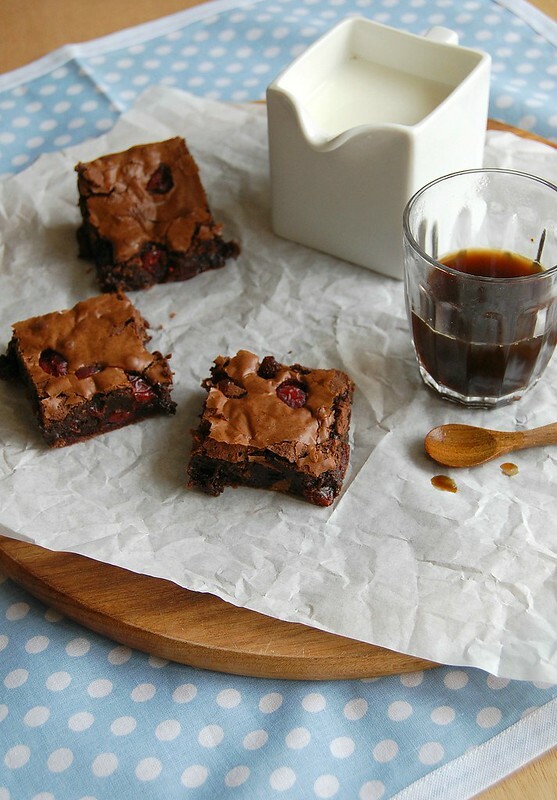 I love the idea of putting cranberries in brownies, your brownies look so delicious! Delicious brownies, I love the cranberries! This sounds like a very Canadian recipe! I can just smell them coming out of the oven!